Live music in any form is compelling and Hamilton County has no short of the best big musical performances in the Midwest. Adding an entire community and a warm summer night to the set list makes it all the more unforgettable. Find a free show or head to one of Hamilton County’s signature outdoor stages. Jam along with chart-toppers or relax on the prairie for orchestral tributes. If you love live music, we’re playing your song. 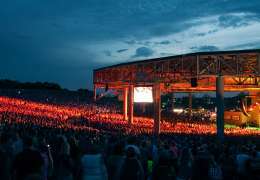 For the best live summer country and rock concerts in the Midwest, Ruoff Mortgage Music Center is the place to go. Click here for hotels nearby. Are you more interested classical music concerts or jazz concerts? The Palladium is for you. In the summer, there is nothing better than a picnic for the family inside the gates of Conner Prairie, listening to the sounds of The Symphony on the Prairie. Don&apos;t forget to go early to get a good spot around the amphitheater.